I’m sure I was just one among thousands—if not millions—of folks who were excited to get their copies of Harper Lee’s “new” novel, Go Set a Watchman. When I picked mine up at Burke’s Books (one of a very few independent bookstores here in Memphis) yesterday afternoon, I chatted briefly with one of the store’s owners, Cheryl Mesler. Would it have been better for this earlier novel to have remained unpublished? Though it does not represent Harper Lee’s best work, it does reveal more starkly the complexity of Atticus Finch, her most admired character. … the novel Lee first envisioned, the story of Jean Louise’s adult conflicts between love and fairness, decency and loyalty. Fully realized, that novel might have become a modern masterpiece. We should have expected this, right? A Pulitzer-prize winning author bravely publishes an earlier work—almost like a famous artist letting the public see her early sketches for a masterpiece—and the critics jump on her before her book is even out of the gate. I reacted first to the controversy around Harper Lee’s Go Set A Watchman, from a writer’s perspective: we, of all people, shouldn’t care that a fictional character appears as a heroic crusader against injustice in one book, and as a racist in another. We should know better than anyone about drafts, and about how characters change. Exactly. And that’s one of many reasons that I AM READING Go Set a Watchman. I want to see how Lee’s writing changed, from this draft of her first novel to the one she was encouraged by publishers and editors to write. I still have a copy of the first novel I wrote back in 2006, The Sweet Carolines. And the two memoirs I penned after that first work of fiction—Dressing the Part and Jesus Freaks, Belly Dancers and Nuns. The idea for the protagonist in my current work-in-progress was actually pulled from a chapter in TSC. But she’s quite different from the girl in that earlier book. There are also many themes in this novel that are present in those early memoirs. These are the tools writers work with—characters, places, themes, stories. Every draft, every attempt at making something beautiful with these tools, is admirable. Writer’s Digest got the title of her book wrong when they printed this quote from Harper Lee. But few people took advantage of the roads, and why should they? If you did not want much, there was plenty. This same small town complacency was mirrored in the summer activities of Scout, Jem and Dill within the confines of Maycomb. And it was also reflected in the ignorance of so many of the adults who were thus cut off from the rest of the world. After a few years, when the children were waist-high, the man would come along whom she should have married in the first place. There would be searchings of hearts, fevers and frets, long looks at each other on the post office steps, and misery for everybody. The hollering and the high-mindedness over, all that would be left would be another shabby little affair a la the Birmingham country club set and a self-constructed private Gehenna with the latest Westinghouse appliances. Hank didn’t deserve that. The writing is good. And if the characters act differently in this earlier novel, well that’s their right. After all, even fictional people sometimes take on a life of their own. I’m just discovering this phenomenon as I pen two new chapters and drop them into the middle of my novel. I have been hearing for years from other writers who say things like, “The words just flowed effortlessly from my fingers to the keyboard,” or “The characters surprised me and took on a life of their own.” I have recently been experiencing these exciting events for the first time and it is truly a gift. After five years of hard work on this novel—including major revisions guided by four different editors, a literary agent, and numerous writers at workshops and in critique groups—I’m tired of the book. It hasn’t been fun most of the time. Until the past four days. Of course I’m anxious to see what my early readers and editors and the agent think of these new chapters, but for now, I’m just going to enjoy the exciting lives my characters are living on the page. 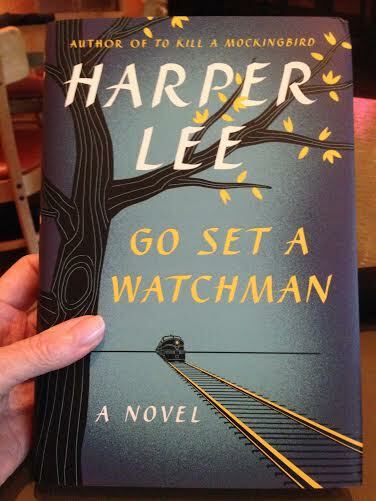 And the lives of Harper Lee’s very human characters in Go Set a Watchman. I hope that readers and writers all over the world will join me in this pleasure and lighten up on all the negativity. Hadn’t considered reading it till now, Susan. I’ll wait to hear what you think when you’ve finished it. I don’t think my opinion is going to change much, Nina…. we’ll see. Thanks for reading! Thanks for this perspective, Susan. The passages you quoted definitely make it sound worthwhile. We all read for different reasons, Katherine. I read to learn how to write better… and to be informed, inspired, and entertained. I think this book will do all three. I loved hearing that your new chapters are flowing freely and making writing the book fun again! Back in the days when I wrote music, there would always be a point when I was just sick of the whole piece, so I am imagining five years of work on a novel as a magnification of those feelings. What a gift to have these days of delight as you finish revisions!